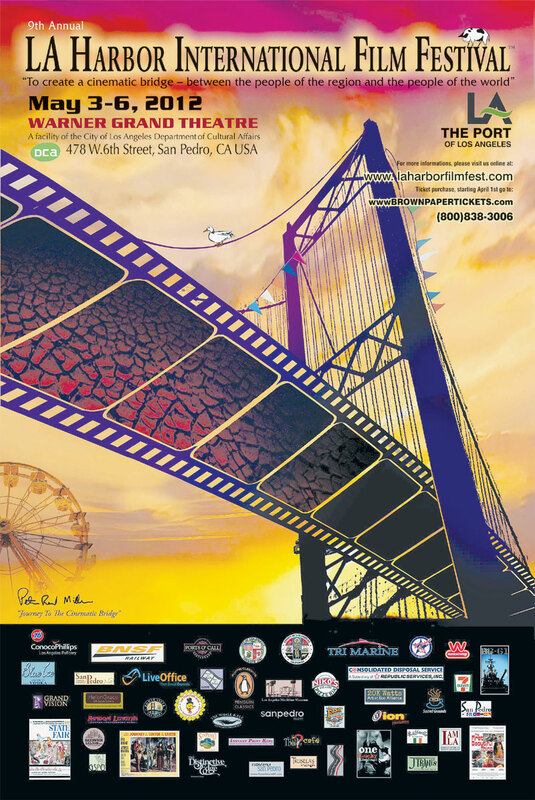 LOS ANGELES — The Los Angeles Harbor International Film Festival will open for its ninth year May 3, showing harbor-related and harbor-inspired films at the Warner Grand Theater in downtown San Pedro. The four-day event is a non-competitive, non-juried film festival with movies selected by research or referral and invitation. At a March 21 reception co-hosted by Ports O’Call, festival director Stephanie Mardesich unveiled the festival’s programming and read a letter from Congresswoman Janice Hahn, who has been a supporter of the Los Angeles Harbor International Film Festival since its inception. This year, prior to the start of each program, the film festival will be show a special short film: “The Journey of the USS Iowa to the Port of Los Angeles.” The 10-minute film is sponsored by Pacific Battleship Center, which is in the midst of transporting the world’s last Navy battleship to its new permanent berth on the Main Channel at the Port of Los Angeles. General admission for festival programs is $10, senior and student admission is $8, and admission is free for U.S. veterans and those currently serving in the military — as long as space permits, on a first-come, first-seated basis. Tickets are sold online at brownpapertickets.com, at Williams Book Store (443 Sixth St. in downtown San Pedro) and at the Warner Grand Theater box office during the festival, one hour before program times. The theater is located at 478 W. Sixth St. For more information, call (310) 519-0756 or visit laharborfilmfest.com. May 3: A free education outreach program titled “Read the Book, See the Movie” promotes literacy and a more thoughtful way to view a film. This year’s selection is the classic novel “Journey to the Center of the Earth,” by Jules Verne. Nearly 900 copies of the book were donated to elementary and adult education students by publishing sponsors Penguin and Puffin Classics. Students in the program will arrive at the theater in the morning to enjoy refreshments and view the 1959 version of the film, starring Pat Boone and James Mason. May 4: At 7:30 p.m., the film festival’s “Opening Night” presents the Port of Los Angeles premiere of the Italian film, “La Prima Cosa Bella” (The First Beautiful Thing). The movie was Italy’s submission for Academy Award consideration in 2011. The program is sponsored by Councilman Joe Buscaino and the Italian American Museum — Los Angeles. May 5: An “Old-Fashioned Saturday Matinee” is scheduled at noon, with a reprise screening of “Journey to the Center of the Earth.” The film is being released on BluRay DVD May 8, and there will be some “lucky winners” of vouchers for the DVD. In the evening, the festival will present a Hollywood Nostalgia Tribute and “State of the Red Carpet Gala” featuring the 1962 film of Rodgers and Hammerstein’s “State Fair,” honoring the film’s star Pat Boone and director Jose Ferrer. The film program at the Warner Grand Theater begins at 7 p.m.
May 6: The closing event, “DocSunday,” begins at 12:30 p.m. with a 15-minute presentation by Ed Steiner of the San Pedro-based TopSail Youth Program. TopSail, supported by the Los Angeles Maritime Institute, offers programs that teach youths the values of “sailing the sea to educate youth for life ashore,” according to organizers, with thousands of young people learning valuable life skills. Following the lecture, the Port of Los Angeles will present the Polish film “Kruzenshtern,” which focuses on director Maciej Cuske accompanying cadets of the Russian Baltic Fishery Academy on their virgin training voyage aboard the four-masted tall ship Kruzenshtern. The final event of the festival will take place at 3 p.m. with another Port of Los Angeles premiere, “One Lucky Elephant” (United States, 2010). The award-winning and critically acclaimed feature documentary has had great success on the festival circuit.